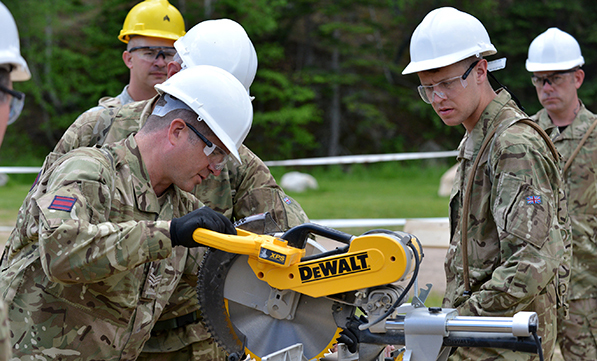 Construction is a big part of the Army’s work at home and abroad. Become a highly skilled Carpenter and Joiner, and you’ll help with all kinds of building projects. Our first-class training will teach you to work from drawings, plan tasks, use workshop machinery and scaffolding, and prepare timber for use. You’ll also learn to make joints, windows, doorframes, partitions, floors and roofing. With this experience plus qualifications, you’ll have a great CV if you decide to leave. Until then, there’s plenty to enjoy: sports, adventurous training and fantastic friends. Plan carpentry and joinery tasks from sketches and working drawings. Learn the use and maintenance of workshop machinery. Prepare timber for use, manufacture joints, use adhesives, produce windows, door frames, door linings and internal joinery fitments. Carry out general construction work, first fix timber frames, second fix internal joinery fitments. Install partitions floors roofing, timber framed buildings, form work and shoring. Construct scaffolding, interpret scaffold terms, erect access scaffold and install access ladders. Then it’s off to the Royal School of Military Engineering Regiment near Camberley for nine weeks. Here, you learn military engineering skills such as knots and lashings, demolition, mine warfare and bridge building. The final stage of training is 21 weeks at the Royal School of Military Engineering in Chatham. Here, you learn how to use machinery and hand tools to make timber building materials. Your training will depend on your military experience, trade qualifications and the role of your unit. If you need basic soldiering skills, you learn them at your nearest Army Training Unit. “I had been a labourer onsite and this gave me the opportunity to gain a qualification. Having the flexibility to organise my reservist role around my job is great."